Wondering how to get kids engaged in bird watching? Bird watching is a great sport for people young and old. Friends and families can spend time together enjoying the outdoors (even if it is from the comfort of a chair placed strategically near a window). For a parent who is wild about birds, getting a child interested in bird watching is rewarding on several levels. Learning more about nature through observation of and interaction with birds is a wonderful way to expand a child's imagination. It's hard to believe anything can be as agile as a hummingbird is, but anyone who has seen a busy hummingbird feeder will tell you they are indeed amazing to see. Bird watching is also a fun way to reward those with an eye for detail. The difference between a purple finch and a common house sparrow may be easy to see in books, but at a feeder you have to look closely to tell which is which. Being able to describe and document the birds they see is an exciting part of the bird-watching experience for children. 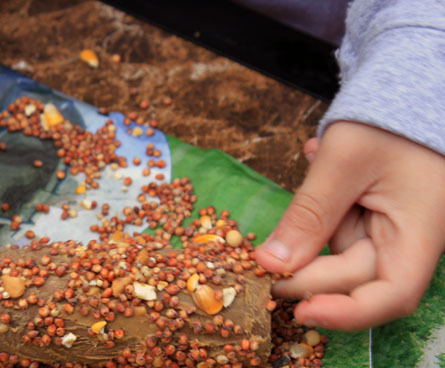 Do-it-yourself (DIY) projects are another great way to get children involved in bird-watching. 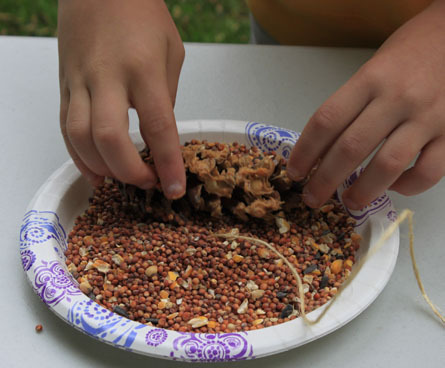 Here are three easy DIY bird feeders that kids can make. Go for a walk and collect a few pine cones. Wrap a string around each pine cone to provide a hanger. 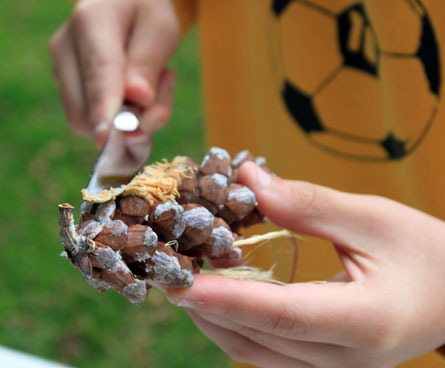 Let your child slather each pine cone with peanut butter, filling the cracks with protein-rich food for your birds. 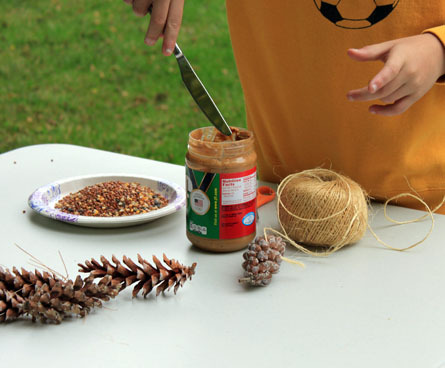 Put birdseed on a paper plate and roll the peanut butter pine cones in the birdseed. Hang it from a tree for the birds (and an occasional squirrel) to enjoy. Use a clothes hanger to create a simple hook. 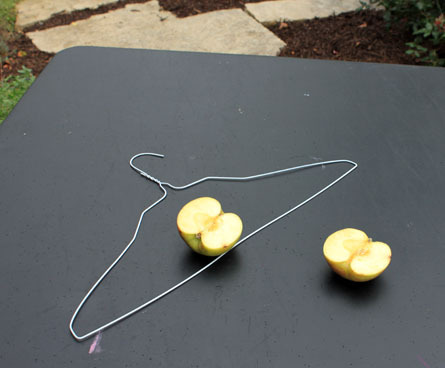 Carefully place leftover fruit on the hook. Stand back and watch the birds enjoy your leftovers. You may want to take the fruit down after dark to avoid attracting unwanted visitors like raccoons. The fruit can be saved overnight and put out again the next morning (assuming the birds haven't already eaten it all). Birds need food and shelter, and sometimes an empty paper towel or toilet paper roll can help your child create both. Start by saving old paper towel or toilet paper rolls. Using a butter knife or your finger, carefully spread the peanut butter onto the empty rolls. 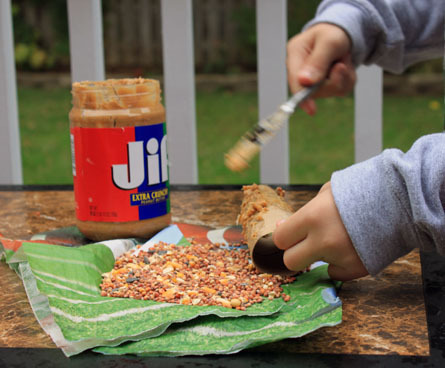 Put birdseed on a paper plate and roll the peanut butter covered paper rolls in the birdseed. 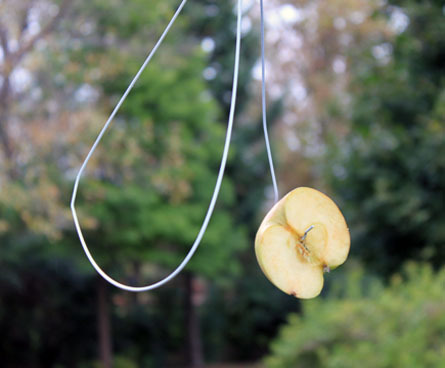 Place the DIY bird feeder over a branch, or hang it on a string. 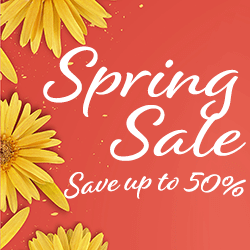 In addition to eating the bird seed and peanut butter, you may be rewarded with birds nesting in your roll or using loose pieces of it as nesting material. 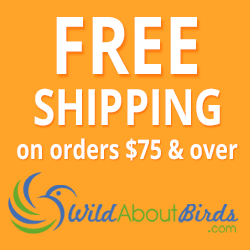 Adding bird feeders to your yard is one of the fastest ways to attract more birds. 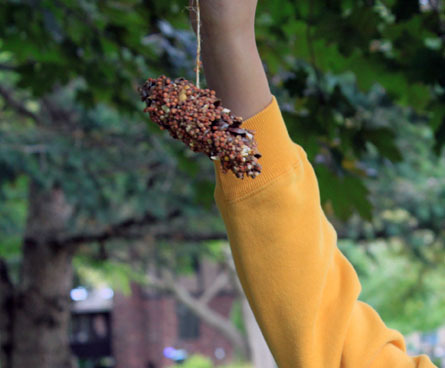 These three DIY bird feeder ideas are just a few of the many bird feeders you can make or buy to help birds find food year-round.